Everyday that I passed-by in Rustan's Department Store located along Ayala Avenue, Makati, I'm always felt amazed how their store designers conceptualized their window displays. 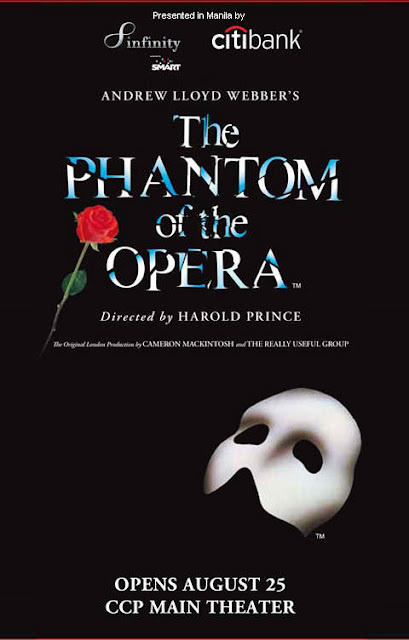 This month's concept supports the extended season of Andrew Lloyd Webber's "The Phantom of the Opera" one of my most all time favorite since I saw it's 2004 movie edition played by Emily Rossum as "Christine" and Gerald Butler as "the Phantom". Not only it's my favorite because of the jaw dropping costumes and settings, but also the real LOVE deeply felt by all characters. .. Rustan's also showcased their latest evening formal dresses, inspired by the opera houses, and 1920's flair.in fashion, intricate beadings, in free flowing fabrics of beige, ecrus, off-whites and creams. THE PHANTOM OF THE OPERA tells the story of a disfigured musical genius known only as ‘The Phantom’ who haunts the depths of the Paris Opera House. Mesmerized by the talents and beauty of a young soprano – Christine, the Phantom lures her as his protégé and falls fiercely in love with her. Unaware of Christine’s love for Raoul, The Phantom’s obsession sets the scene for a dramatic turn of events where jealousy, madness and passions collide. The timeless, romantic and much-loved musical has been honoured with seven prestigious New York Tony Awards, among them the Tony for Best Musical, seven Drama Desk Awards and three Oliver Awards. I hope you get the chance to see it! I have not seen the movie, but it sounds amazing!